Syris products enhance the vision of medical professionals during general skin exams and dermal procedures by removing surface glare. This is particularly helpful during procedures for Rosacea, Mohs, Botox injections, facial fillers, hair removal or restoration, tattoo removal, laser, spider veins, telangiectasis, and other aesthetic and cosmetic procedures. My main usage of the Syris Vision System is in patients with Rosacea and other vascular related affections such as telangiectasia and spider veins. In several cases, it helped me make a more accurate diagnostic than other everyday usage tools. 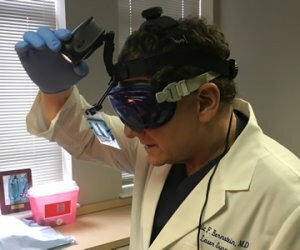 In patients with complex vascular redness that were sent to me for a second opinion, I could rely on this advanced vision system to easily differentiate the source of patients’ facial redness.